On March 1, 2016 after nightfall at 8 pm, I heard a large animal breaking through the snow crust. I was in the ravine on the east bank of Sawmill Creek about 500 m north of the bus transitway station on Walkley Rd. Amidst the light brush and deadfall, I looked from behind a tree, and the startled Wolf or Coyote (about 30 feet away) turned and bolted. It had dark fur around its face. A month earlier, at the same locale, there were tracks of a large canine in the fresh snow and bloodied remains of a small mammal, with no human footprints nearby. I see small Otters which have burrows along this creek bank. 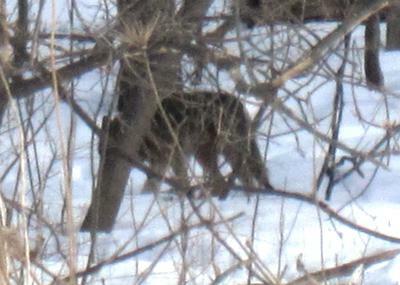 On March 18, 2015 at 2 pm, I photographed a shaggy brown Wolf or Coyote walking east in the light brush along the base of Codd's Rd hill, north of Montreal Road. I was in the open about 100 m away, but the animal was not afraid, just kept walking. A fellow walking his dog nearby informed me others have sighted wolves in the area.